In Montreal these days, nothing ventured really is nothing gained when it comes to our abundant restaurant scene. With the year we’ve had, where so many restaurants have been hit with hard times or worse, we should be thankful that there are people still willing to invest their time, money and hope in to pleasing our palettes. 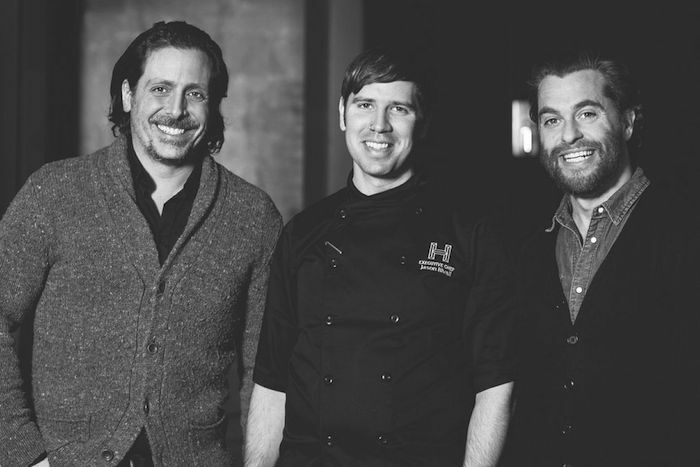 The masterminds (Franklin Yaiche and Steve Benhamron, pictured below with Head Chef Jason Bivall) behind Harlow, one of Montreal’s most promising new restaurants, have made a bold move by opening smack dab in the middle of Place Jacques-Cartier. It’s a move, they seem confident, will pay off for everyone involved. 15 years ago, Old Montreal was not much more than a ghost town of historic proportions. Today, the beautiful neighbourhood is bustling with tons of great restaurants and shops and is now frequented by as many locals as it is visitors from around the globe. 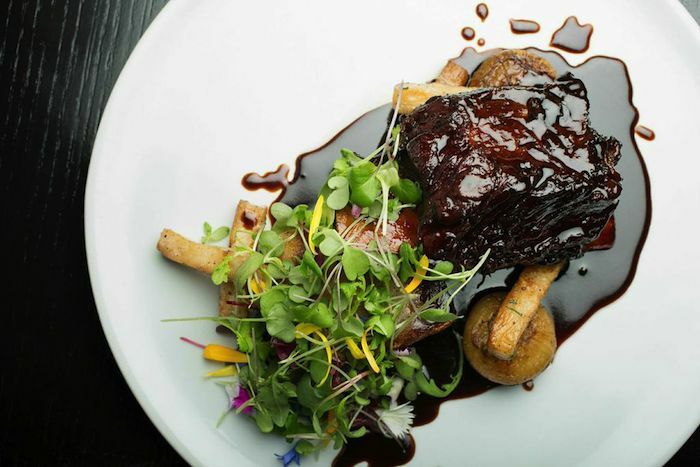 During this turn around, Place Jacques Cartier has remained relatively untouched with restaurants designed to please visitors, looking for a “European inspired” dining experience. With Harlow now open, the Square has a new player that aims to set the bar higher and become a destination for anyone who has an interest in a more fully realized dining experience. 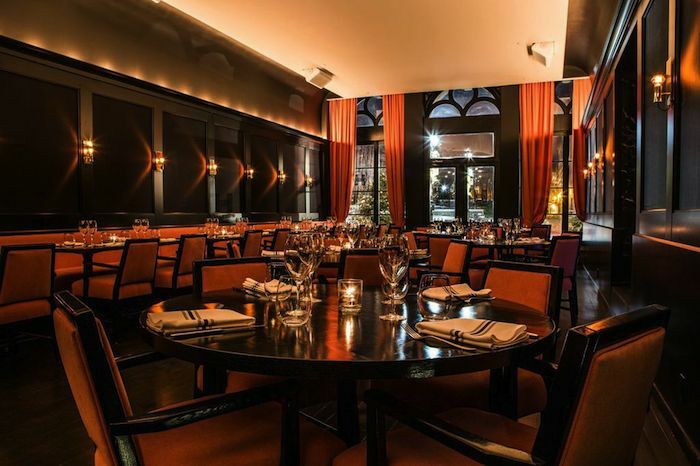 Named for Jean Harlow, the sultry, Golden Age Hollywood actress who ruled the silver screen in her day, the restaurant takes a step back in time when bustling restaurants were packed to the brim with glamorously dressed women and their equally dapper counter parts. Harlow evokes a time where sounds of music, chatter and movement flowed though decadent rooms where clouds of smoke added a hint of mystery and anonymity. Though there’ll be no smoke at Harlow, the rest of that Old Hollywood inspired charm will be there. Harlow is a multi-tiered, gorgeously decorated dining/nightlife experience that offers four distinct experiences under one roof. Starting with the bar, it’s the first thing you see when you walk in the door. 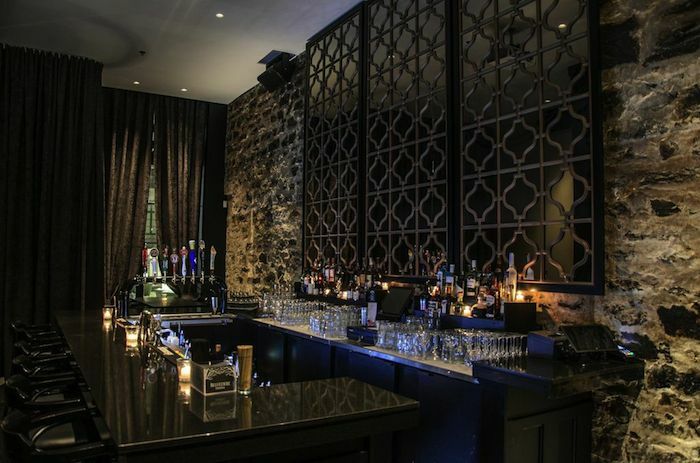 Backed by a stunning mirror and a backlit stone wall, the bar (and most of the area) is dark and elegantly mysterious. 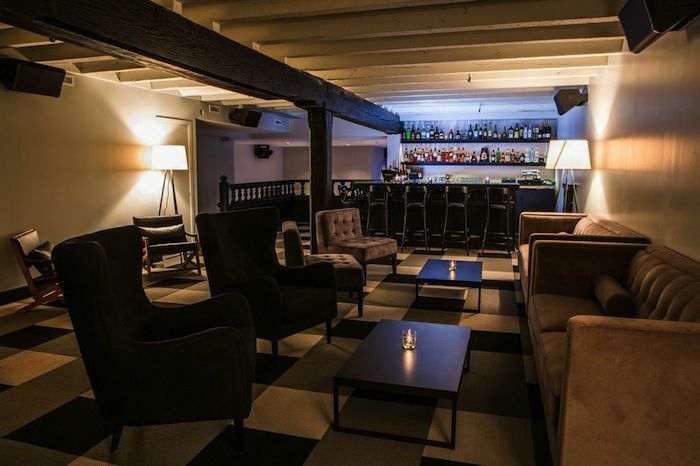 It will be the perfect place to sit and have a drink while waiting for a table or even just a drink on its own. There will be a menu exclusive to the bar for those looking for something to snack on. Sitting just beyond the bar area is a dimly lit lounge with two large leather banquets for larger gatherings. The ceiling is low and covered with white coloured wooden slats giving the space a modern, back room feel. Just upstairs (a beautiful dark wooden bannister) you’ll find another sitting area but this space is far more modern and open, decorated in several shades of gray, complete with its own bar and plenty of comfortable seating. Aiming to please, no matter what have in mind for a night out, Harlow has all the bases covered. The restaurant’s dining room is spectacular and perfectly decorated (décor enthusiasts take note). A simple palette keeps the space muted yet elegant. Dark coloured wood, green marbled walls and splashes of salmon on the drapes and plush seating invoke an almost regal, wow-inducing elegance. The lighting also plays with shape, adding further dimension to the space. In the summer, a terrasse will be added to the front of the restaurant, adding about 50 more seats for those who love to dine in the open air. A group of Montreal’s media and bloggers were invited to Harlow last week, two days before the official opening, to have a look at the restaurant and sample some food from the menu. We were greeted with a cocktail (the Harlow – cassis, lime, gin and Prosseco) by some very friendly wait staff and after a bit of mingling we were ushered through a small passage to the beautiful dining room. Once we found our seats, we pulled in and the meal started. With an almost choreographed precession, the waiters, waitresses and sommelier marched out of the kitchen and started filling our glasses for the first course. To get started, we were served a buttery fois gras that had marinated in 20-year-old Calvados and filled with black truffles. The consistency was perfect while the flavor from the black truffle blended perfectly with that of the fois gras. For the second service, we sampled a deconstructed Waldorf salad. 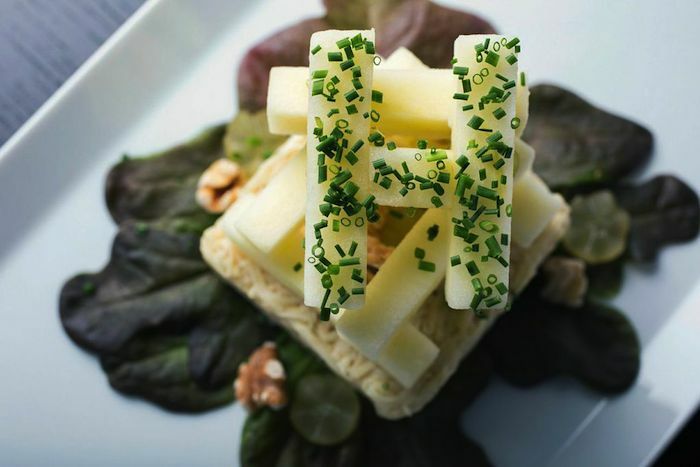 Harlow’s take on the famous salad was one of my favorite dishes of the night with fresh Honeycrisp apples stacked on crunchy toasted walnuts and artisan grapes. It was a standout dish. Four our third course, we tried the yellowfin tuna crudo with finger limes, lemongrass, ginger, baby coriander and a zesty vinaigrette. The dish was fresh and beautifully presented while the vinaigrette gave us one of the zippiest surprises of the evening. The fourth dish warmed things up with a glass of tangy lobster bisque. Topped off with Pernod, fire-roasted peppers and heirloom tomatoes, the bisque hit all the right notes. Each of the first four dishes was served with a glass of crisp Prosseco supriore brut, a perfect accompaniment. Another of my favorite dishes was the ricotta gnocchi, which was served up as our fifth sampling. 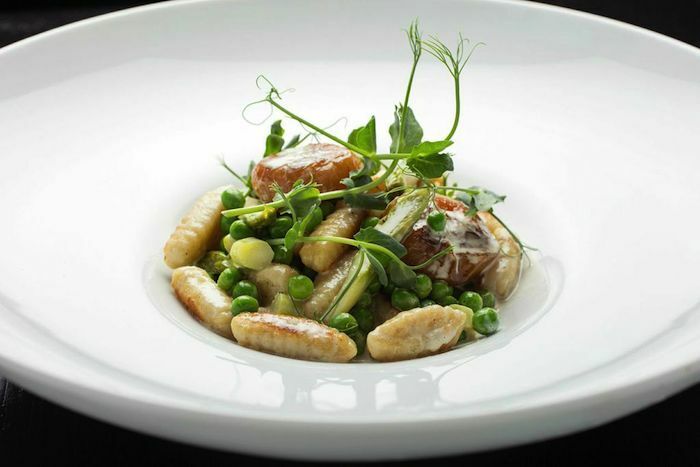 The homemade gnocchi was served with sweet green peas, asparagus roasted cipollini onions and a creamy roasted garlic foam. I could have gone for a lot more gnocchi and it will be something I’ll order again. Next up was a serving of braised AAA beef short ribs with roasted celery root, cipollini onions, a wonderful potato galette and red wine jus. The ribs were slow cooked for four hours and feel off the bone. The dish was savoury and as Jason Bivall, Harlow’s head chef explained to me, the menu will change slightly from season to season, putting focus on the fruits and vegetables that are available locally during the time of the year. The root vegetables were roasted perfectly and retained a little sweetness that balanced well with the ribs and jus. Last but not least came dessert. You might thing we would all be rolling out of our seats at this point (which we were) but there’s always room for dessert. 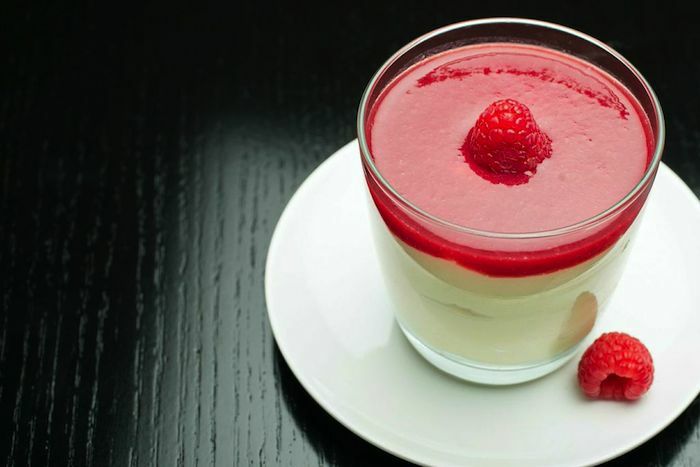 The served each of us a pistachio and white chocolate mousse cake verrine with a raspberry coulis. Like much of the meal throughout the night, the dessert was fresh and light, a perfect punctuation to the evening. 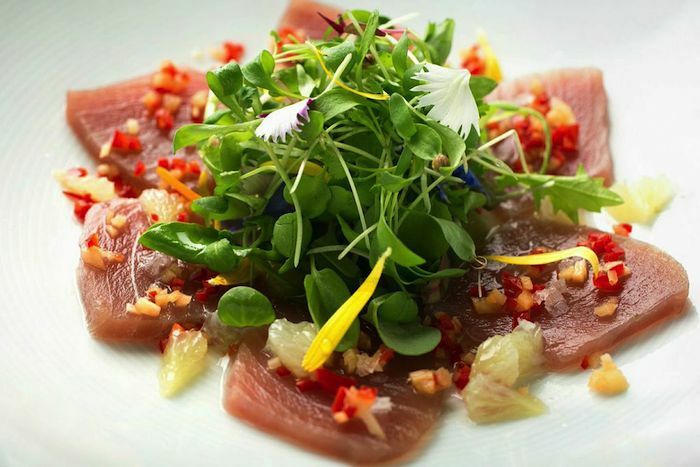 Harlow is a restaurant that aims to impress from the minute you walk in the door. I’m excited to see how far they will push the boundaries of what we have come to expect from Place Jacques Cartier. Taking risks is what the restaurant business is all about and by taking what they have started (and learned from previous experience in the restaurant industry) with an elegant atmosphere, pleasant service and wonderful food, they can push on even further. There’s a hunger in Montreal for something new and something inspired and with more bold moves, Harlow has the potential to satiate that hunger.